The Ketty La Rocca Research Centre by the artist Sally Schonfeldt (b. 1983 in Adelaide, lives in Zurich) is the second project in a series of Artista Laureato, introduced by Istituto Svizzero di Roma to seek alternative models in the education system through dialogue between its agents – art academies and cultural institutions. The Artista Laureato (graduated artist) cycle presents the work of artists who have just taken a degree in the Visual Arts and investigates the positions of professionals in the field of education and contemporary art. The program triggers analysis of the training of artists, considering the fact that since the avant-gardes of the 20th century the academic environment has been considered incapable of producing innovation. Schonfeldt’s project, which she instigated in 2011 during her studies at the Zurich University of the Arts and which is now presented at Istituto Svizzero di Roma, is inspired by the Italian artist Ketty La Rocca’s piercing exploration of language in her video works, performances, text-image collages and photography. A neo avant-garde artist, Ketty La Rocca (b. 1938 La Spezia, d. 1976 Florence) was part of the Gruppo 70 “poesia visiva” movement and worked at the forefront of experimental art in Florence in the 1960s and 70s. In 2011 Schonfeldt embarked on a one-year discursive research that not only revisited but also encompassed a multitude of thematics contextualizing the work of Ketty La Rocca. Fascinated by La Rocca’s progressive deconstruction of the dominant use of language and her radical focus on the potential of the non-verbal and the gesture in her later works, Schonfeldt encircled La Rocca’s oeuvre through a subjective reflection and readings into historical and contemporary feminism. The results of this artistic mediation were first presented using the format of a “reading room” that allowed for an informal approach to the reading of Ketty La Rocca’s positioning within an art historical context. The new instalment of Schonfeldt’s project in Rome takes the form of a “research centre”. Playing with the bureaucratic notions of spaces associated with the terms “centre” and “research”, Schonfeldt contradicts them by proposing an intimate and subjective display. 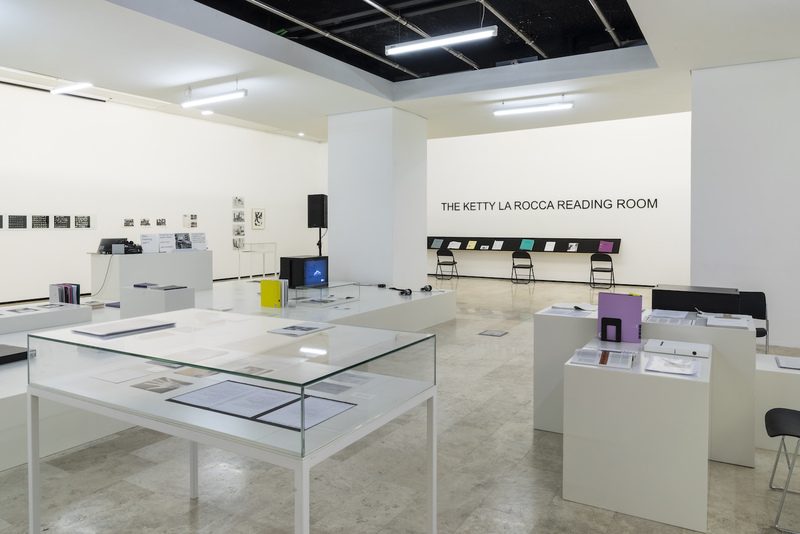 The Ketty La Rocca Research Centre is designed as a platform, both literally and metaphorically, to stage the material collected by Schonfeldt in order to facilitate an open and accessible reading of Ketty La Rocca’s artistic practice. La Rocca’s artist’s books, exhibition catalogues, ephemera from her past exhibitions, magazine reviews and video works, amongst them Le Mani, which Ketty La Rocca produced for the Rai TV program Nuovi Alfabeti in 1973 are contextualized by further discursive books and texts on such themes as “poesia visiva”, Gruppo 70, Italian feminism and artistic research. Rather than attempting a retrospective homage, Schonfeldt’s “research centre” allows for a celebration and recognition of La Rocca’s contemporariness. It becomes a dialogue between women artists and musicians connecting different generations and geographies. On January 16, the space will be opened up to collaboration with other contemporary artists, musicians, theoreticians and writers engaged in collective and feminist practices. Under the title Echo La Rocca – The Sound as the Trace of Her Voice and in collaboration with OOR Records (Zurich) the exhibition will be expanded hosting temporary bookstands, talks, sound interventions and performances in response to La Rocca and the space provided to actively engage with her multi-faceted practice. Adding to the research conceived by Schonfeldt, The Ketty La Rocca Research Centre hosts an ongoing research by Zurich based graphic designer and DJ Anna Frei into women in early electronic music that she has followed over the past years and in which for this occasion she will instigate a new in-depth research following the traces of La Rocca’s own early involvement with electronic music in Italy in the 60s. The new instalment of Schonfeldt’s project in Rome is an active space: an other library, an other exhibition, an other research centre, an other reading room, in which the various discourses encircling Ketty La Rocca meet. Here dialogues over historical contexts and spaces are generated anew using the artist’s perspective from the “outside” as enforced by Schonfeldt’s experience and by establishing contact with scholars, artists, gallerists, art historians, critics and family members involved in nurturing the presence of Ketty La Rocca in the contemporary. Sally Schonfeldt (b. 1983 in Adelaide, Australia) lives in Zürich. She graduated in Fine Arts from the Zurich University of the Arts in 2014. Her work is predominantly concerned with the dialogical relationship between theory and the potentialities of an artistic, aesthetic research practice. She applies historiography to question modes of knowledge production in relation to post-colonial discourses and the position of women within history. Her previous works include Plattenstrasse 10 (2014) and The Struggle within the Struggle (2015). Her upcoming work (in collaboration with Very Ryser) investigates an obscured manifesto written by migrant women in Switzerland in 1975 and seeks to re-position it within a contemporary actuality. Anna Frei (b. 1982 in St. Gallen) lives in Zurich. She is an artist, graphic designer, DJ and cultural producer. Her activities are embedded in research surrounding emancipatory, artistic and musical practices. In 2014 she co-founded the multi-sided space OOR in Zurich, which is both, a record and an art bookstore as well as a space that hosts live- performances, readings, DJ sets and sound-art ftini-Acts. OOR also archives and makes accessible online live- recordings, mixes and audio-pieces and it produces audio editions from its events.